Wilson Electronics’ line of commercial-grade cellular DAS (distributed antenna system) solutions addresses the needs of both businesses and public entities. Are carrier agnostic, and work on all major U.S. cell networks. Support 4G and 3G data. Are cost effective, with much lower price per square foot of coverage than competing fiber DAS systems. Are designed, assembled, and supported in the United States. 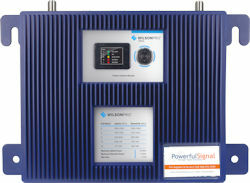 Have an industry-leading 3-year warranty on amplifiers. The WilsonPro 4000 and 4000R enterprise product line includes both rack and wall-mount options. The 4000 and 4000R are the equivalent of having four WilsonPro 1000 units in a single box. Using XDR (Extra Dynamic Range) technology, the 4000 and 4000R will never shut down in overpower and other strong signal situations. The WilsonPro 1000 and 1000R commercial product line also includes rack and wall-mount options. The 1000 and 1000R are designed for small-to-medium size offices and large homes. Using XDR (Extra Dynamic Range) technology, the 1000 and 1000R will never shut down in overpower and other strong signal situations. 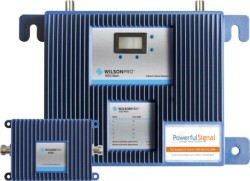 The WilsonPro 1000C with WilsonPro Cloud service gives installers the ability to monitor and control the amplifier remotely from a smartphone, computer, tablet, or other device with web access. The Pro 1000C can also send notifications to alert integrators of any status change in an amplifier, such as the amp going offline. The WilsonPro 1050 inline system is a WilsonPro 1000 unit combined with an inline amplifier. 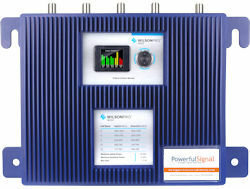 This inline unit increases signal strength in situations where long runs of cable result in unacceptable signal loss. When greater cellular user loads are required, the WilsonPro 70 PLUS is an excellent choice for businesses and public buildings. The Pro 70 PLUS can handle more users and heavier data traffic than the Pro 70 series. This system can be scaled from small offices to large buildings and warehouses. The Pro 70 is Wilson’s entry-level business product that addresses small businesses with buildings up to 10,000 square feet. The Pro 70 is designed for business environments with poor cell signal and low-to-moderate cellular user loads. …or click here to get a free custom quote for your building. 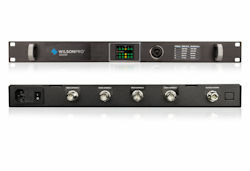 Let us help you determine which Wilson commercial amplifier is right for your business, organization, or government agency.